For some of us, laundry needs to be done more than once a week. For others, once a week is just fine. We are also likely not polishing silver weekly. So let’s take a look at how we can customize a weekly plan that works for us. There are two ways to think about your weekly routine. The first is to have days for specific things like housecleaning, errands, laundry, etc. The second is to spread your housecleaning chores across the week, picking a day for each task. Either way, you’re going to want to make sure that it’s customized to your schedule. If someone in your family has an activity that goes into the evening, you’re likely not going to want to schedule something that takes a while to do. Save that for the day of the week where you don’t generally have a lot going on and have a larger block of time available. Laundry is done as needed and by my husband. (Yes, I know I’m lucky.) I usually do the sheet and towels loads and items requiring special care. Daily I am checking the floors (sweep? mop? ), clearing the counters and dishes, and trying to keep ahead of the clutter, especially the paper clutter. 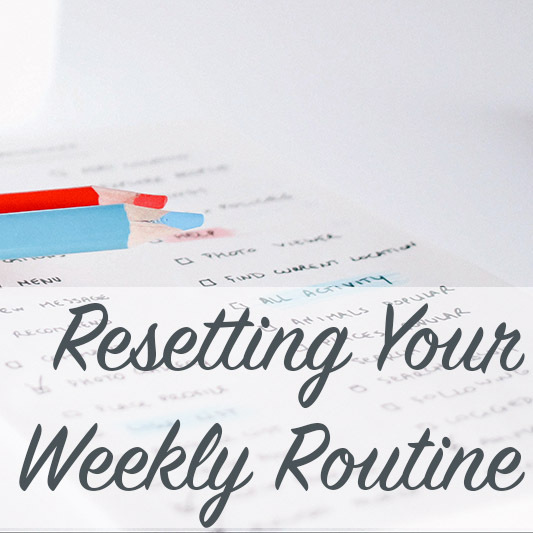 Why are these routines – morning, evening, and weekly – important? So this series is about resetting our homes. Why have I spent three days on looking at our daily routines? Routines help us maintain. Once we’ve done a deep cleaning, the weekly cleaning routine will keep the dirt down so that the next round of deep cleaning won’t take quite as long. Routines make sure that if not completely spotless, our homes are picked up most of the time and presentable. When my home is cluttered, dirty, messy, the thought that I need to clean it nags on my brain, and it becomes a source of stress. For me, a presentable home is a source of peace.